Although Eric Railsback has access to superstar (and super pricey) bottles whenever he wants, he focuses on sourcing affordable bottles from exceptional producers in regions around the world (to go alongside all that Raveneau). Although Eric Railsback has access to superstar (and super pricey) bottles whenever he wants, he focuses on sourcing affordable bottles from exceptional producers in regions around the world (to go alongside all that Raveneau). 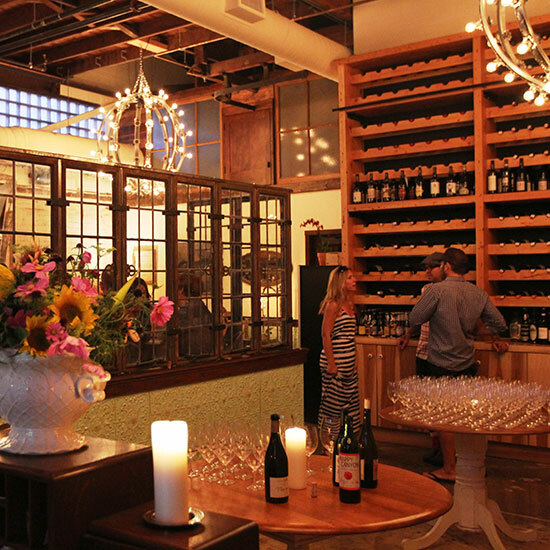 All of the wine is sold at retail prices and guests pay just a $20 corkage fee to drink the wine there, at Les Marchands. I was never able to buy this when I was working in San Francisco, because there are so many people fighting over it. This year, I was able to buy 20 cases, though, because nobody knew what it was here in Santa Barbara. It’s from Saint Joseph, from all-terraced vineyards. It’s pretty much like a Côte-Rôtie. It’s the sort of wine that I call a “sommelier wine.” We drink all of this crazy stuff at work, but personally, I buy wine from all the same producers, but I get their entry-level stuff. They age super well, they’re great bottles and you can afford to buy them on a sommelier salary. They’re more interesting to find than the $200 bottles that maybe you can drink once a year or something. With this, you can buy cases and try it throughout the year. I just discovered this wine this year. It’s from a super-small producer in Santa Barbara. It’s pretty fun and super elegant. I’m not really a big Grenache fan because they can be really high in alcohol and heavy, but his Grenache is super delicious. It’s crazy—we’ve almost sold his whole production here (I think he made 220 cases or something) because we always carry it and have it by the glass. People love it and they’ll just buy cases to take home—probably more so than any wine that we’ve had since we’ve been open. This is my favorite wine right now. The wholesale price is $8, so we sell it retail for $12, which is pretty ridiculous. There’s not a lot of $8 bottles that I really want to drink at home. Some of my better collectors here—who will buy crazy high-end stuff when they’re doing parties at their house—they’ll buy three cases of this because it’s so good. They may usually be drinking Jayer and all this crazy stuff, but the wine is so good for 12 bucks retail, it’s hard to put down. There are like 15 families with the same name—Quenard—there’s this intersection when you’re in the Savoie and there are like eight different signs saying Quenard and pointing in different directions. It’s super easy for us Americans to get lost. This is from a family that’s super legit and this bottle is 100 percent Jacquère. It’s a great winter wine because it has a lot of texture, but it’s also light and refreshing. Now that I own the business, I’m not trying to drink all the high-end Burgundies, I’m drinking the fun stuff. I would say Jacky Blot’s Taille Loups—it’s a Montlouis producer that is one of my favorite Chenin Blanc producers—is definitely the inspiration behind Lieu Dit’s Chenin Blanc. It’s super mineral, no botrytis, not a lot of texture—well, classic Chenin texture, but definitely more reeled in than a lot of the barrel-fermented stuff. That’s right at $20 retail. It’s definitely a wine that I’ve been buying in the past couple of years to age. It ages super well. It’s definitely a cellarable wine at that price. It’s something that I sell to a bunch of serious wine buyers who normally are spending many times the bottle price, but it delivers so much for 20 bucks. I try to push it as much as possible. This is a new Barolo that I just found this year, which is kind of odd, because there aren’t a lot of new Barolo producers coming out; it’s a super-traditional, old-school region. This is the first vintage that was brought into the country. It’s 60 bucks retail, but I think it drinks much higher. I think it even drinks on the Bartolo Mascarello level, which are all over 100 bucks. It’s super pure Nebbiolo that’s really elegant. It’s probably the most fun wine that I just found out about from a super-traditional region where you don’t usually find new things. Torture Device or Best-Ever Wine Opening Tool?